Airless Tires Market size is estimated to surpass USD 200 million by 2024; according to a new research report by Global Market Insights, Inc. Global airless tires are expected to reach approximately 139 thousand units till 2024. Rising demand from off-road and heavy commercial vehicles along with high adoption from military sector, especially in developed countries across the globe will primarily drive the industry growth over the forecast timespan. Manufacturers are continuously developing airless tires for utility vehicles including golf carts, lawn mowers, etc., paving opportunistic ways for the airless tires market. Industry participants are focusing on developing these tires using recycled materials, that results in eco-friendly products. Puncture proof, durability, and ideal for rugged applications are other advantages that will push the manufacturers to increase their production, further strengthening the airless tires market demand over the coming years. However, high production costs along with limited performance during high speed or friction will hamper the industry growth. Low penetration of these tires has pushed the manufacturers to focus on their mass production. For instance, Michelin has been selling its airless tire “Tweel” for commercial vehicles, Bridgestone has designed a tire that is expected to be commercialized for two-wheelers by 2019. Regular innovations such as contact area information system by Bridgestone will further induce immense potential to the airless tires market size. Automobile OEMs are adopting these airless tires in their vehicles for overall weight reduction, opening new growth opportunities. For instance, Toyota is considering non-pneumatic tires supplied by Sumitomo Rubber Industries for installing in its electric vehicles to reduce the overall weight of the vehicle. Radial tires are anticipated to exhibit maximum revenue share, crossing USD 140 million over the next eight years. Rising focus of industry participants towards production of these tires owing to their benefits over the counterpart will contribute significantly towards the high revenue generation. These benefits include higher flexibility and strength along with enhanced shock absorbing ability. Bias tires are likely to exhibit a CAGR of over 9% owing to its cost effectiveness as compared to radial tires. Moreover, high usage in heavy vehicles will further support the airless tires market growth. HCVs are likely to dominate the airless tires market, holding more than 27% share till 2024. This can be attributed to rising implementation of these tires in heavy vehicles owing to their capability of carrying more weight. Shifting focus of major manufacturers such as Michelin towards developing these tires for HCVs will further support the industry dominance over the coming years. Terrain vehicles will exhibit over 9% CAGR owing to high usage of non-pneumatic tires. This is credited to their advantages such as durability and comfort on uneven surfaces. Plastic will capture over 65% of global airless tires market volume share over the forecast timeframe owing to shifting preference of tire manufacturers towards usage this material. Bridgestone engages in production of non-pneumatic tires made of plastic. This shifting focus can be attributed to its advantages over rubber such as recyclability and lesser weight. Cost effectiveness is another factor positively influencing the industry growth. Rubber will witness a sluggish growth owing to its excessive cost and stringent regulations regarding curbing its usage in regions such as Europe. Airless tires of size 21-25 inches are likely to dominate the airless tires market with the demand of over 46 thousand units till 2024. The high demand is primarily credited to their extensive usage in commercial vehicles across the globe. High deployment in terrain vehicles will further escalate the revenue generation. Tires above 35 inches will grow rapidly, exhibiting approximately 10% CAGR owing to rising demand from military vehicles and vehicles used in construction & agriculture. OEMs are likely to dominate the airless tires market, accounting for over USD 198 million over the next eight years. Durability of the OEM products along with the better service will primarily support the substantial revenue generation. Moreover, OEMs ensure efficient maintenance of product safety standards, further supporting the industry dominance till 2024. Aftermarket will grow significantly, witnessing over 10.5% CAGR owing to cost effectiveness as compared to OEM and high replacement of conventional tires with airless tires over the coming years. 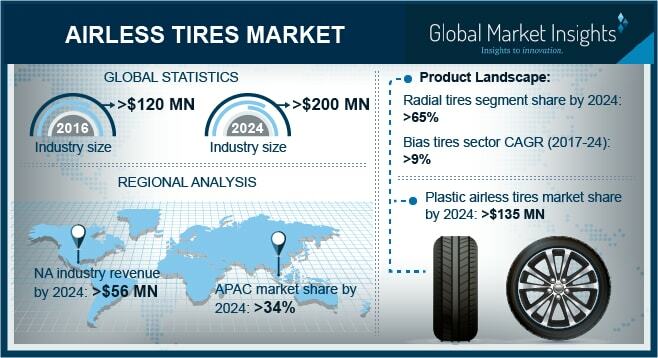 Asia Pacific airless tires market will capture highest revenue share, with over USD 57 million over the forecast timespan. Rising production of commercial and military vehicles, especially in developing countries will primarily contribute to the revenue generation. Presence of established manufacturers including Sumitomo Rubber Industries and Toyo Tires will further support the region’s dominance. North America will acquire over 26% of the revenue share over the next eight years owing to high demand from the military sector coupled with initiatives from major manufacturers such as Michelin to open manufacturing units to produce these tires across the region. Michelin, Sumitomo Rubber Industries, Bridgestone, Hankook, Toyo Tires, Goodyear Tire and Rubber Co., and Toyo Tires are among the noticeable participants in the industry. New product developments and geographical expansion are prominent strategies implemented by the industry players to strengthen their visibility. For instance, in July 2016, Hankook completed testing on its new iFlex airless tire that is made of recycled and eco-friendly materials.